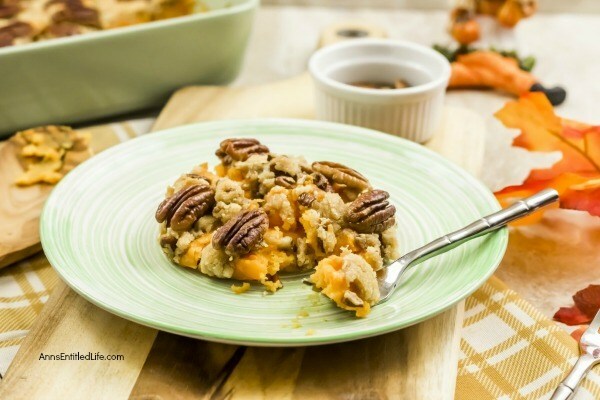 A delicious, easy to prepare sweet potato casserole recipe your entire family will enjoy. 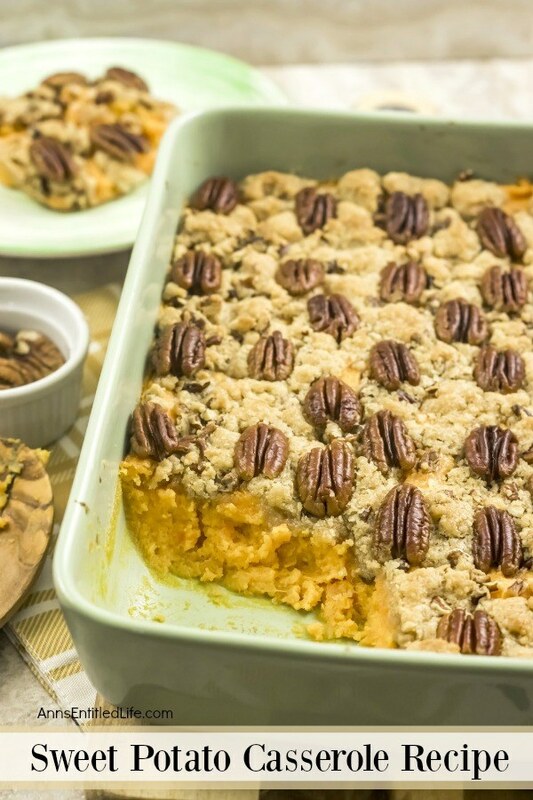 This classic sweet potato recipe is a wonderful side dish that pairs well with turkey, chicken or pork. This is a fantastic, out of this world delicious recipe. Don’t just make it for Thanksgiving (I need to take my own advice on that one), but make it when you have pork or chicken too! 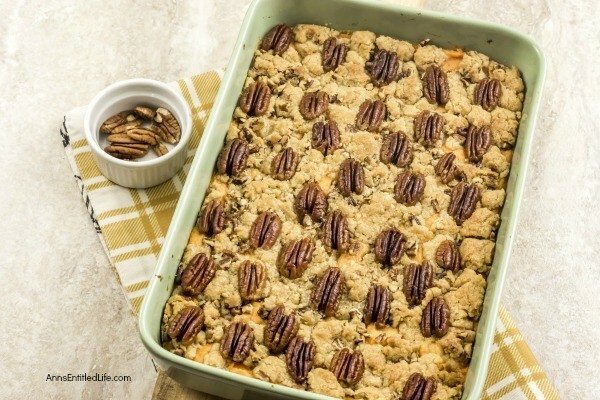 • If you like, you can double the brown sugar, flour and make that cutting-in-butter a whole stick to double the topping. You may have to bake a few extra minutes if you do. 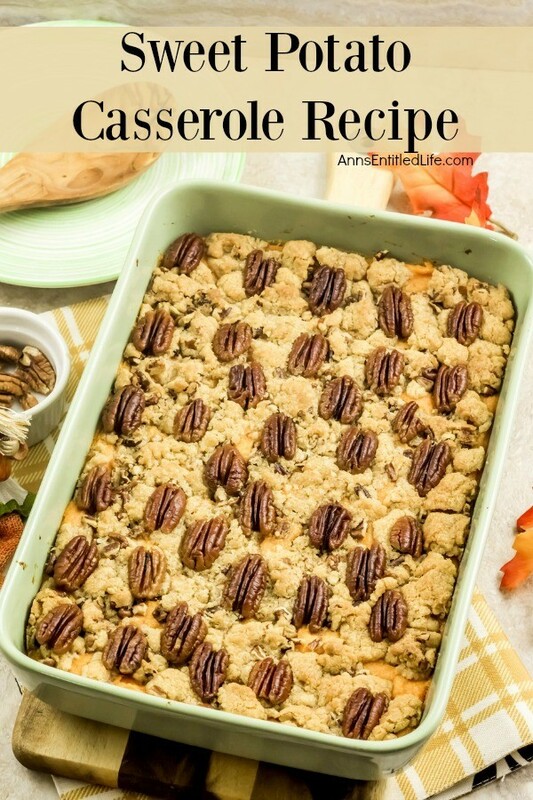 • I also suggest using WHOLE pecans for that last ¼ cup you place on the top of the casserole for aesthetic reasons. 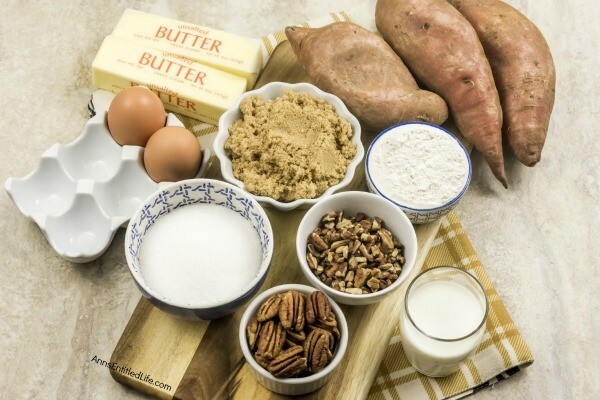 So use pecan pieces in the sweet potato mixture if you like, but use whole pecans for the final top. 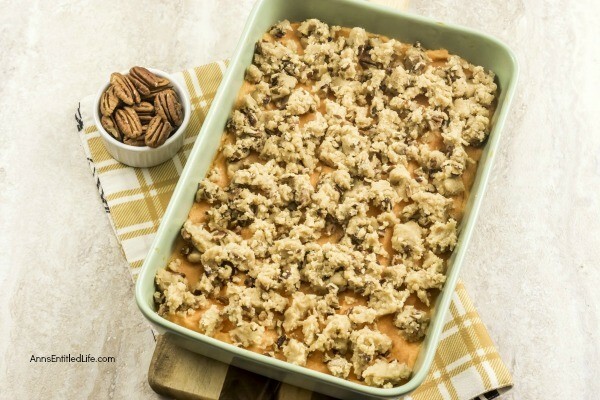 Your sweet potato casserole will present better to your guests and family. • This is also a nice “leftovers” dish. 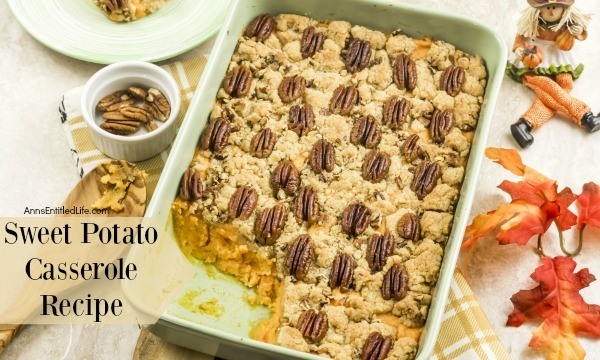 By that I mean if you have served whole, baked sweet potatoes for a meal (say Thanksgiving or Christmas), and you have leftovers, make this recipe to dress them up! You’re probably eating leftover turkey, so why not take the leftovers meal up a notch? 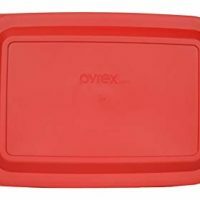 • Grease a 13″ x 9″ baking pan with butter; set aside. 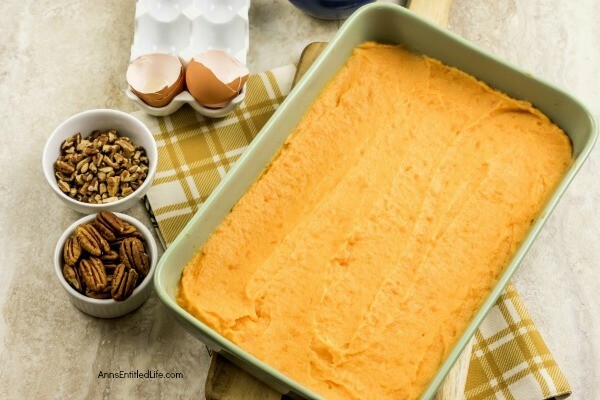 • Peel, cook and mash sweet potatoes so you have 4½ cups of mashed sweet potatoes. • Melt ½ cup butter. 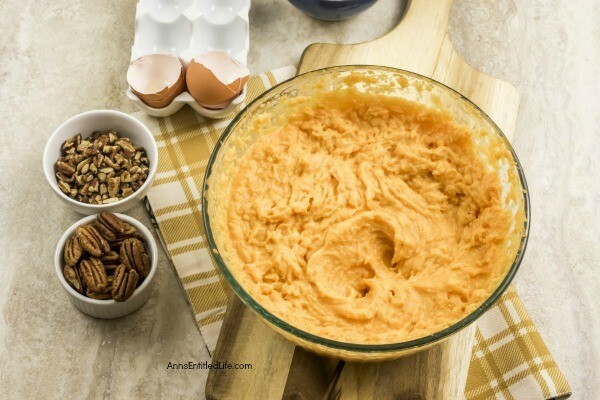 • Using a stand mixer, in a large bowl mix together mashed sweet potatoes, melted butter, half and half, sugar, vanilla extract and eggs. 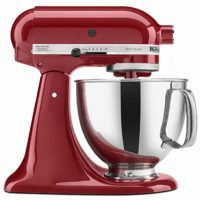 Mix until whipped. 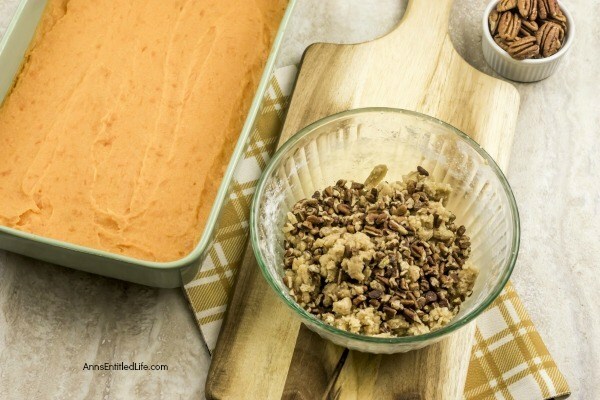 • Spread sweet potato mixture into the prepared 13″ x 9″ baking pan. Set aside. • In a small bowl, mix together brown sugar and flour. Cut in remaining ½ cup butter (unmelted). 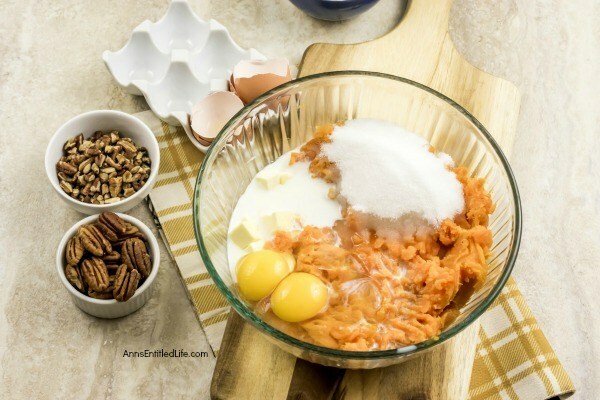 Cut together the brown sugar, flour and butter until the mixture is pebbly, then, stir in ¾ cup of pecans. 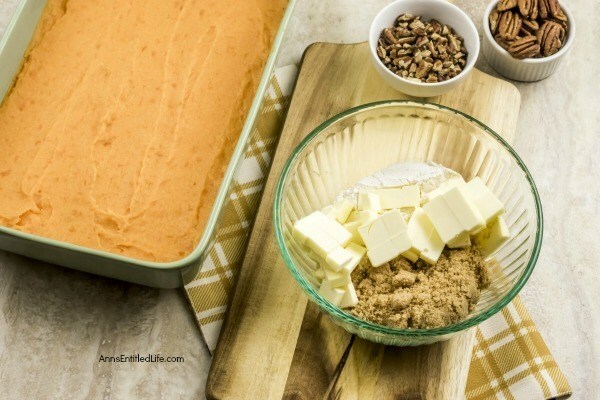 • Sprinkle brown sugar mixture over the top of the mashed sweet potato mixture in the baking dish. 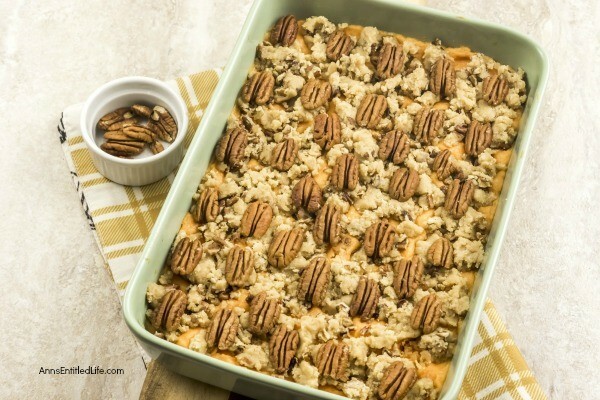 • Place the final ¼ cup of pecans on top of the casserole. 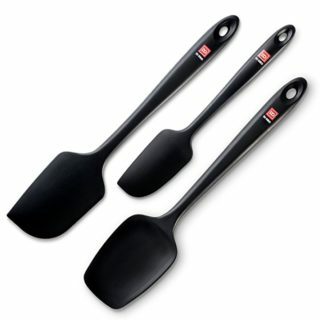 • Bake for 25 minutes in a preheated 350° oven. 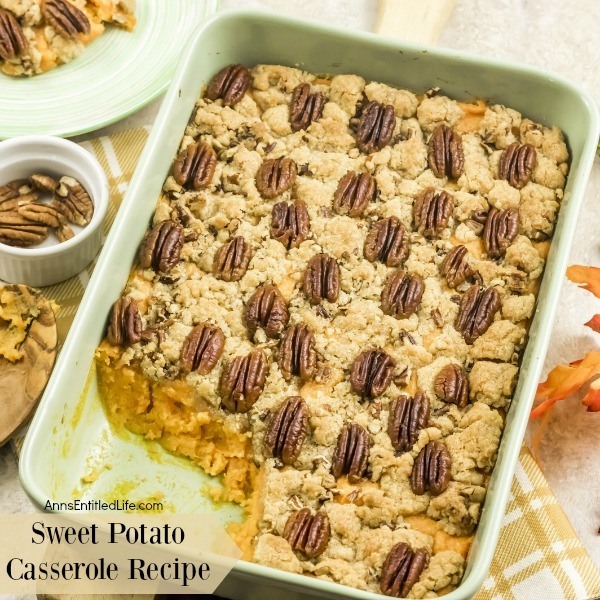 Beautiful sweet potato casserole in a servings dish. • The Best Cranberry Sauce Recipe – This super easy to make fresh cranberry sauce is simply delicious. If you ever thought that making your own cranberry sauce was difficult, disabuse yourself of that notion as nothing could be further from the truth. I was shocked at not only how easy cranberry sauce is to make, but how much better it tastes than pre-made or canned cranberry sauce. I think I made this recipe six times last year alone simply because we enjoyed it so much, and it is so incredibly simple to make. • Oven Roasted Autumn Vegetable Medley Recipe – This terrific sheet pan oven roasted autumn vegetable medley recipe makes great use of in-season fall vegetables. Easy to make, this sheet pan veggie recipe is the perfect side dish for pork, chicken, turkey, and more! Your family will love this delicious roasted vegetable medley recipe. Yum! 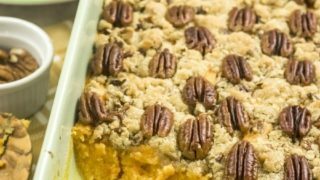 My brother makes something similar to this for thanksgiving. Thanks so much for posting this on the Sunday Features 101 link party. 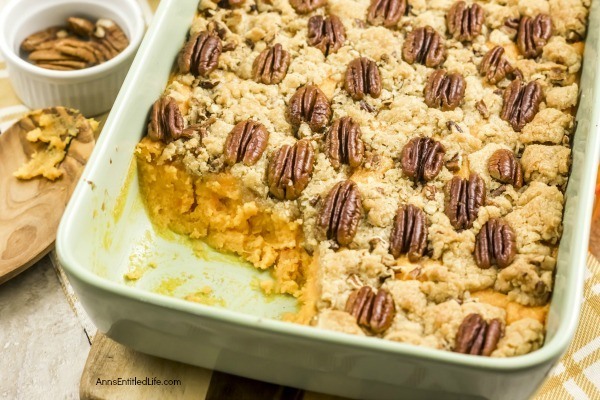 I’m going to feature it next month on my thanksgiving recipe post! I love sweet potato so much. I could truly eat it at every meal. This looks perfect for Thanksgiving this year. Thank you for sharing!